An evening with Albert Speer. 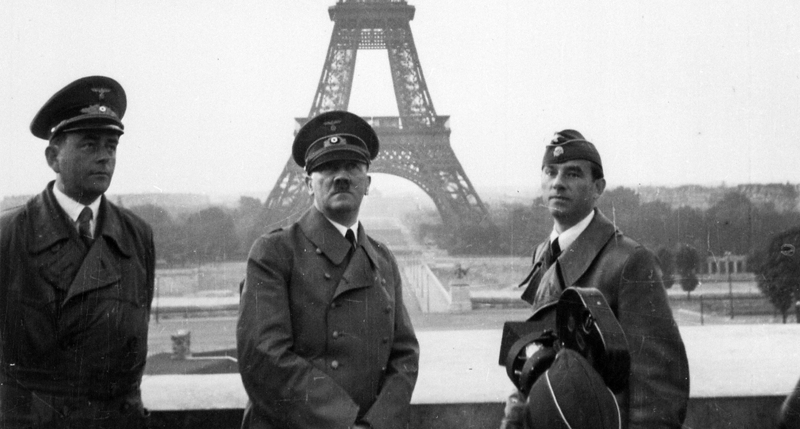 Adolf Hitler visits Paris with Albert Speer (left) and artist Arno Breker (right), 1940. Photograph by Heinrich Hoffman. United States National Archives and Records Administration, College Park. Albert Speer was relaxed during our interview and had no qualms about revisiting his lurid past. He could talk about those years for hours in that fluent, Franconian-accented English of his. He learned it from his American and British military guards in Berlin’s Spandau prison where he was incarcerated for war crimes until 1966. He was lucky not to have been hanged with Ribbentrop and the others. “Why do you agree to meet foreign journalists like me, and patiently answer our endless questions?” I asked him. “It is my duty,” he replied. “I am the only one left of Hitler’s innermost circle. People such as you and your audience have a right to know.” I got the feeling Frau Speer, who was sitting by his side, had heard it all before. It was a shining midsummer day in 1974, and we were sitting out of doors on the terrace of the large comfortable family home that had once belonged to his architect father, and to which he had returned after Spandau. We were close to the romantic red sandstone Heidelberger Schloss, once sacked by Louis XIV and among the finest palaces in northern Europe. Beyond it we could see the vineyards of the Neckar River valley and the Palatine hills—and a thousand feet below us, the baroque spires and medieval squares of the ancient university town where Goethe had fallen madly in love and General George C. Patton had died. For two hours Speer had been talking about Hitler. “To him, architecture was a magic word,” Speer explained. “It was his hobby and his passion. He was a self-taught amateur, it’s true, but he knew a lot.” The architect was famously charming. The British author Gitta Sereny, who is Jewish, confessed she found “a good deal to like” in him as she grilled him for her book about what she termed “his battle with the truth.” So when Hitler’s master builder, minister of armaments and war production—and, some would say, only true friend—invited me to stay for a drink, who was I to resist? Apart from the opera, the other must-see for Hitler was Napoleon’s tomb. He gazed down at the French emperor’s sarcophagus at Les Invalides for “a very, very long time, without uttering a single world, as if mesmerized,” Speer recounted. It was this, combined with his admiration for the Roman Pantheon that set him thinking in the early war years about his own mortal remains, and how they should be displayed for posterity. Thirty years later the Führer ordered the rebuilding of thirty German cities, and Speer’s particular mission was to reshape Berlin. “My architecture was essentially political, a display of power,” said Speer without a hint of apology. “Some clever English critic recently called it ‘total’ architecture. The Romans understood this. When they built the new marbled Rome, the Emperors Augustus and Hadrian set out to intimidate, to create awe. My Berlin was designed to do the same. It was modeled on Roman lines. A new imperial Roman city would be laid out with the main avenue being a north-south cardo maximus. This bisected a decumanus maximus running east-west, in the city center, and there, where they crossed, was the forum, where the great public buildings were positioned. Berlin was going to have that. At our intersection we were going to create a huge public forum with massive monuments and state buildings on display—the so-called opera publica. That was where the almost unbelievably massive Volkshalle was going to be. Hitler wanted it to be a copy of the Pantheon in Rome—but twenty times larger.” At this point Speer took out a drawing folded into one of the books he had fetched and spread it on the stone terrace floor. It must have measured three feet by six. “There,” he said. It was the plan, rendered in faded shades of brown and green on a scale of 1: 4,000. At the top of the by-now deeply creased architect’s sheet, it simply said: “A new plan for Berlin, based on an idea of the Führer’s, and worked out in detail by A. Speer.” “Hitler was of course a megalomaniac,” said the former Nazi Inspector General of Buildings for the Renovation of the Federal Capital, matter-of-factly. Speer was so damned detached, it was hard for me to reconcile this scene with reality. “I can’t believe I’m sitting with a man who knew Hitler, was his friend and was part of the whole evil machine,” I found my inner self exclaiming naively, over and over, as I sat alongside him getting what was, to all intents and purposes, a private academic tutorial in Nazi Architecture and City Planning 101 from the master. The great British historian Hugh Trevor-Roper always used to say Speer the rational technocrat and careerist was a worse war criminal than the fanatics around Hitler who had actually believed in something, however insane and evil, and should have been executed alongside them. Early on, Speer told me, Hitler was tempted by the idea of a green field-city on a virgin site—a fascist Washington. An area was actually earmarked by Hitler in flat marshy Mecklenburg to the north of Berlin, near the Baltic. “Eventually he came to the conclusion that artificially created capitals are lifeless,” Speer said. So, the old provincial Prussian backwater would remain the capital of Germany, after all, but it would have to be made architecturally worthy of the new Reich. Hitler was fond among his inner circle of reminding them that Bismarck had preached pan-Germanism to the Catholic Bavarians and Frenchified Rhinelanders after the coming of the second Reich. He, in his turn, would give the far-flung Germans of his third Reich—among them Austrians and Sudeten Czechs—a sense of identity and community by changing the old city’s name. From now on Berlin would be known as Germania. (Speer was referring there to the final scene of Wagner’s portentous 1842 opera Rienzi—first seen by a bedazzled Hitler in Linz when he was fifteen—based on the true story of Rienzi di Cola, the fourteenth-century populist tribune who raised the power of the Roman people at the expense of the nobles but ended up opposed by all. As he faces death in the burning Capitol, the tribune curses Rome and its ungrateful citizens. “May they be destroyed! Let Rome collapse!” The handwritten score for Rienzi was given to Hitler by Wagner’s family as a fiftieth-birthday gift. Among his most cherished possessions, it was allegedly with him in the bunker at the end). After a comfortable night and early breakfast in the Zum Ritter, Heidelberg’s oldest inn, I drove to Frankfurt airport and was in London for lunch. Some years later, a BBC colleague invited Albert Speer to London to talk about Hitler the artist and architect, as he had talked to me, but this time on the record. Speer, naturally, agreed, and was filmed and taped at BBC Television Center for an entire day. That evening he retired to his room in the nearby Kensington Hilton, had a massive heart attack, and died in the night. Peter Foges is a film and television producer. He worked for the BBC in London for fifteen years as a correspondent, an anchor, a producer, and a director before moving to the United States to serve as BBC TV’s bureau chief. For the BBC he produced The David Frost Show and directed numerous documentaries, including Kennedy’s Been Shot and Good Night and Good Luck. He later became director of news and public affairs programming for WNET/Thirteen in New York City, where he created and produced such series as Adam Smith’s Money World, The Struggles for Poland, and From D-Day to Berlin. Other U.S. TV credits include The Eyes of War with Robert Mitchum, Richard Burton: An Actor’s Life, and Putin’s Russia: Threat or Promise? He co-wrote The Ten Year Lunch: The Wit and Legend of the Algonquin Round Table, which was awarded the 1987 Oscar for best documentary feature.